The Walled City of Intramuros is Manila's pride when it comes to culture and history, and it also happens that Intramuros is a favorite destination of balikbayans, tourists, and even locals. Aside from the old structures, Fort Santiago, churches, and museums, it also offers a number of notable restaurants such as Barbara's. Located just a few steps away from San Agustin church, Barbara's is known for its old Manila glamour. Think Maria Clara and Crisostomo Ibarra. The place is not just a restaurant, it literally takes you back in time and makes you appreciate the country's illustrious past as you walked up the wooden staircase and into the foyer. There are candelabras, silver mirrors (I got two of those, thanks to my lolas), heavy wooden chairs and tables, and a grand piano. 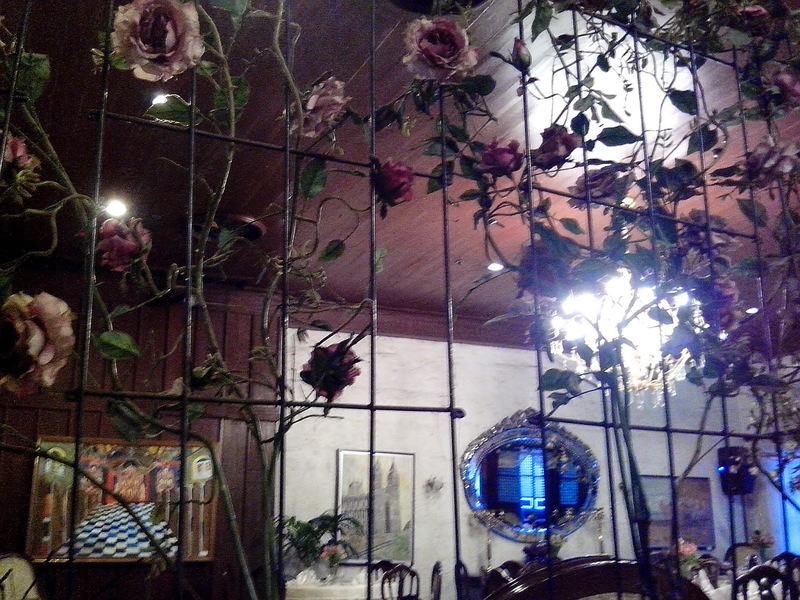 This is my family's fave restaurant in Intramuros especially if we have foreign visitors or balikbayan relatives. The place itself is a great conversation piece. Fresh Lumpia. Slivers of ubod with lettuce then wrapped in special lumpia wrapper (crepe-like). Then there's the garlicky sauce that adds flavor to the lumpia. Great for vegetarians too. Salad Bar. This is the Filipino's version of a salad bar. There's steamed okra and eggplant, diced tomatoes, minced onions, diced green mangoes, salted egg, and choices of sauce (fish bagoong, shrimp bagoong, calamansi). Mix everything and pair with grilled meat or fish and you're ready to go. Pork Adobo. This is the unofficial national dish of the country. The cooking practice of adobo varies from the numerous provinces all over the Philippines although most common ingredient is soy sauce, vinegar, and bay leaf. Inihaw Na Chicken Wings. Grilled chicken wings. Paella. You can feast on this alone since its already a complete meal. It has rice, seafood and meat, and vegetables. Yum! Espesyal Na Laing. I'm not really an expert when it comes to laing but the taste passed with flying colors, according to a fellow blogger who happens to hail from Bicol- the land of laings. Inihaw Na Pla-Pla. Grilled fish. This is best paired with the stuff from the salad bar. Some might wonder why the buffet selection is not as extensive as other restaurants but believe me when I say that every dish here is a winner. 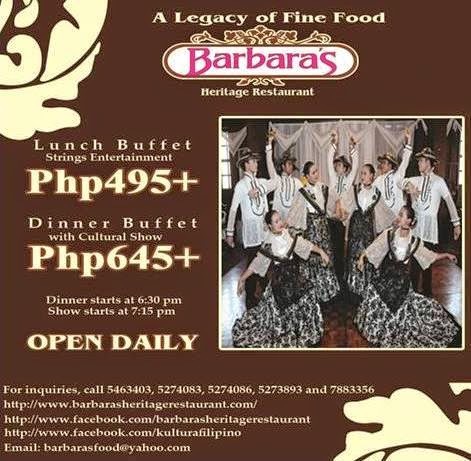 Aside from the mouthwatering dishes that Barbara's has to offer, there's also the famous cultural show for the evening diners. This is truly a memorable experience as one will enjoy watching the different dances from some regions in our country. And you need not be a balikbayan nor a tourist to appreciate this. I highly recommend that everyone dine at Barbara's and watch the cultural show. And I think its the only restaurant that has a cultural show. Lucky tourist from Korea dancing the "tinikling." Oh! I've read about Barbara's before but the food shown were different. Dito -- wow! Lumpiang ubod, Laing, Pla pla....Panalo! Planning to take the kids there to experience a bit of culture. Do they always have dancers? This is such a great place! My fave dish is kaldereta! I could go just because of that. Is the place kid-friendly? I want the lumpiang ubod! Whenever I go there, I end up doing the tinikling. I love it! It takes you back in time. I love Intramuros! We actually had our prenup there since we wanted a vintage feel for our wedding. :) I've never tried Barbara's though. The only resto we've tried there is Ilustrado. This gives me an idea where to take balikbayan friends and relatives. 'Would love to see the cultural show myself. Barbara exudes a very Filipino ambience! Their Laing looks delish! I've always wanted to visit this place. Been reading a lot of good feed backs.